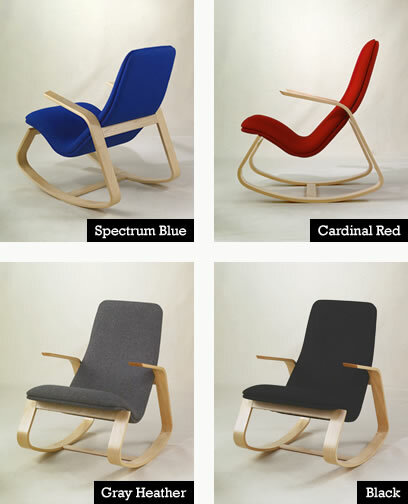 The bentwood Rapson Rocker, designed by architect Ralph Rapson, was first built for the Museum of Modern Art in 1939. A solid wood version of the chair was offered to the public in 1948 by Knoll, who sold it as part of their "Rapson Line." Knoll sold the design to Bloomingdale's in 1945. Bloomingdale's took out a full-page ad in the New York Times to promote the chair, proclaiming it an "innovative and attractive modern take on a traditional piece." The Rapson Rocker has recently been reintroduced by Rapson Inc, and it's now available from the Wieler Store. To ensure that the chair meets the architect's original standards of quality, production is being overseen by Rapson Architects of Minneapolis, MN. The maple frame is finished with two coats of clear lacquer. The seat is upholstered with a high-quality polyolefin fabric. 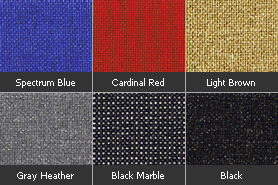 The fabric resembles wool and is is exceptionally tough and stain-resistant. 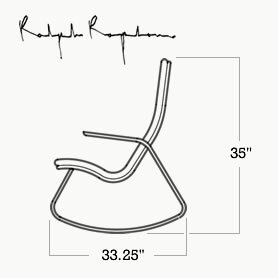 The chair's dimensions are 26.25" wide, 35" high, and 33.25" deep, with a weight of about 30 pounds. 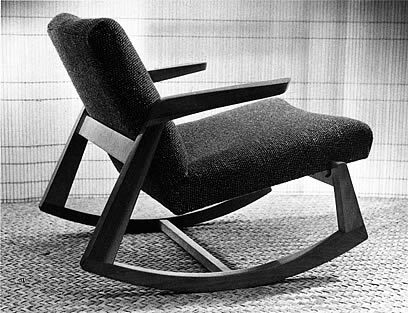 Above: The 1945 version of the Rapson Rapid Rocker, licensed and manufactured by Knoll.